If you’re trying to become a Visual Designer, you probably already know that your portfolio is the most important tool in your arsenal as you get ready to apply to jobs or look for clients. But when you’re just starting to build up your portfolio, it can be difficult to know exactly what sorts of projects you should be including in your portfolio. And once you do come up with ideas for projects, how do you build them into comprehensive case studies that will impress any potential employers checking out your site? We chatted with hiring managers across the creative industry to find out what sort of projects they’d like to see in the portfolios of new junior designers applying for jobs. Keep reading for more info about the exact projects that you should work on to build up your design skills and show that you are capable of executing all the types of design work you’d likely be working on as a junior designer. And for all of these projects, we’ve created step-by-step project guides that will help you build up detailed projects in each of these categories and craft an amazing portfolio. One note – we’re recommending a variety of Visual Design projects to help you get experience building different types of design projects from scratch, but when you’re actually getting ready to apply to jobs, it’s generally a good idea to decide what area of design you’re most passionate about and focus most of your portfolio site on those types of projects. Employers want to know that you have a deep expertise in your chosen field! Before we dive into the specific types of projects you should be working on, it’s important to note that recruiters across the board told us that they want to see projects based on real problems that exist in the world rather than just seeing pretty visuals. They want to know that you can solve problems with your designs. Here are two ways to start solving real problems with your designs, even early in your career. It might seem daunting to approach real clients early in your career, but even if you’re not being paid for the work, reaching out to local businesses and nonprofits offering your design services is an amazing way to build your skills and impress employers. It’s as simple as walking into local businesses asking if they need help with marketing campaigns or branding, or emailing nonprofits to ask if they need any design support. Employers want to know you can work within real world constraints, so this is a great way to show that you can incorporate constraints! Even if you’re not doing “real client” projects, it’s important to ensure that all of your project ideas attempt to solve real problems that exist in a particular industry or field. So when you come up with high level project ideas (e.g. doing a branding project), spend some time thinking about the industries you want to work in. Then look at a few companies in those industries and see how their brand or business could be positively impacted by a redesign. You could even come up with your own business or brand from scratch based on a gap you think exists in your target industry, and design a project for them from scratch. As long as you are trying to solve real problems and test your designs against mentors and peers, you’ll be good to go. Finally, be sure that instead of diving straight into Illustrator or Photoshop, you spend time following the proper design processes for each project – research the industry and problem, come up with personas, ideate and sketch, and validate your designs with someone else. Alright, let’s dive into the 7 projects every aspiring designer should work on! When you’re getting ready to apply to jobs or reach out to clients, a strong personal brand can help make you more memorable, showcase your style and tone of work, and convince anyone looking at your portfolio site that you’re truly passionate about design outside of your 9-5 job. It also shows that you have an opinion or point of view about design and are willing to boldly attach that opinion to yourself for everyone to see! Assume for a moment that you are an employer looking through hundreds of design portfolios every day, looking for the perfect candidate to add to your design team. You decide whether or not to pass on most portfolios within about 10 seconds of landing on their homepage. Your personal branding, just like any other strong design project in your portfolio, should follow a design process — the same process that you go through when completing a Branding and Identity project for any client. You need to spend time ideating about what you want your branding to say about you, sketching ideas, refining a few of them, and then choosing typography and a color palette that matches. If you’re interested in branding design, then it’s a no-brainer that you’d want to include at least a few branding and identity projects in your portfolio. For this branding project, you should come up with a totally new company in an industry you’d like to work in, or find a company in that industry whose branding you think might be holding it back from greater success. You should go through the entire research → moodboard → ideation → sketching phase before diving into Illustrator. For your final project, include a new logo, typography, colors, and overall look and feel. You can present all of these deliverables in a Style Guide for the brand. Being able to develop iconography with a consistent look and feel is an important skill for most designers to have. Even though there are tons of incredible icon services out there, like Noun Project, you should feel comfortable developing your own icons from scratch if you want to work on the design team for a larger company (or even a smaller studio). For this project, focus on building out a full set of iconography for a digital product or website of your choosing. Before you dive into research, you should decide where in the client’s product or website these icons will be used and what they’ll be used for. Are they going to be used to accompanying text and information or are they more navigational icons? Write down details about what types of icons you’re going to be designing and where they’ll show up in the product or website. This is a necessary step to take prior to conducting research or sketching. Being able to create effective marketing collateral for employers and clients is an incredibly valuable skill and something you will definitely be involved in at various stages of your career. For this project, come up with a theoretical product or find an existing product that you like and design a digital and print marketing campaign for the client. In your final deliverables, include 2 Facebook ads, 1 Instagram ad, one print poster (24x36”), 4 display banners (sized at 300x250, 300x600, 728x90, and 970x250), and one 4x6” postcard. Be sure to include copy and strong calls to action. For your final presentation, mock them onto relevant platforms. If you want to focus primarily on digital products, this project might not be for you. But if you’re interested in working at a company that sells physical products, being able to design packaging and a label for the products is a great way to stand out from the crowd. For this, you’ll help a client create compelling packaging that speaks to their brand identity while also informing consumers about relevant aspects of their products. Your final presentation should include dielines of your designs as well as the final label design in vector format. You can also include a style guide with things like color, typography, and overall look and feel. For this project, you’ll identify a client and develop a set of print collateral for their business, ranging from business cards to posters to postcards. Being able to create effective marketing collateral for employers and clients in a variety of print formats is an incredibly valuable skill and something you will likely be doing at some point in your Visual Design career. For the final deliverables, include on set of business cards (front and back), two print posters (24x36”), two 4x6” postcards, and one additional 4x4’ sign to be used in an outdoor marketing campaign. For this final project, you’ll be focusing on showing your ability to generate unique typographic layouts and improving your familiarity with typography in general. You can create a typographic poster for a film or cover for an album, with a strong emphasis on using typography and type lockup to create a mood and visual look. You should only use very minimal photography or graphic elements in your design. This project will focus on helping you become familiar with typography in design and is designed to show you the broad range of emotion that type can elicit. Recruiters love to see well-rounded designers, so even if you’re focus is on web design or product design, showing that you can use typography to create a more emotional response in viewers is incredibly important! Working on those 7 projects will give you amazing exposure to the 7 types of projects that recruiters have told us they’d want to see in most junior portfolios. 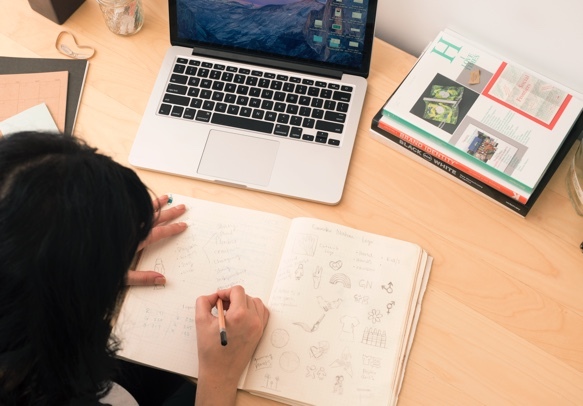 You don’t need to include all of these in your portfolio (in fact, you probably shouldn’t), but working on these projects should help you broaden your design skills and identify the areas of Visual Design you want to focus on in your career. From there, you can start to specialize and deepen your skillsets in one or two of these areas. 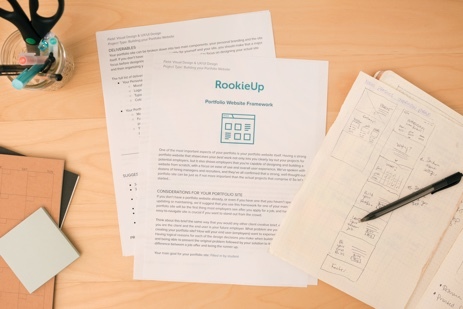 If you want a more comprehensive step-by-step guide to building out each of these projects, check out our Portfolio Starter Kit, and if you’d like to build up your portfolio with a mentor, check out our Career Bootcamps!